You are here: Home › Stayfitcentral Health & Fitness Blog › Health & Fitness Blog › Weight Loss › Fish Oil For Weight Loss – Get The Facts Here! Years of peer-reviewed research proves that taking fish oil for weight loss works. Whether you are into Crossfit, Spartan races, or other sport and want to shed excess fat to perform your best or just want to lose that belly to feel and look better, it can help. Just by taking a few capsules a day you can lose an additional 2 or more pounds of pure fat in a month without any nasty side effects. When included with all of the additional benefits of fish oil (build lean muscle, better workouts, less joint pain, etc. ), this is a supplement that all of us who train, diet, and supplement to be all we can be need to take. After reading this article you’ll know how fish oil is better for fat loss than any caffeine-loaded weight loss pills. Many researchers and fish oil experts including author of ‘The Zone Diet’ and researcher Barry Sears, PhD, believe that the inflammation reducing properties of omega 3 fats in every capsule are responsible for burning off excess fat. Excessive inflammation in the body due to eating the wrong foods, stress, etc. that lasts can, over time, leads to weight gain and all around poor health. Left unchecked this can even lead to a condition called Metabolic Syndrome, which is a precursor to type 2 diabetes. This occurs when your body can no longer take the abuse and is super inflamed on the inside. As a result, you end fat, bloated, sore, and tired. Research shows that taking fish oil can stop this excessive inflammation before it gets out of hand and keep you lean, healthy, and strong (2). Even if you are already in great shape, think of taking fish oil for fat loss as an insurance policy against any future fat gain. Studies show that the anti-inflammatory power of fish oil can help you lose in several ways. The most important are listed for you below. Supplementing with fish oil decreases abdominal and waist circumference, measures in overweight men and women (7). Taking fish oil decreases insulin resistance which makes losing weight easier (4). When combined with diet and exercise, fish oil supplements can help you lose more weight and body fat than diet and exercise alone (3). Studies show that taking a fish oil supplement after you eat helps you stay full longer (3). Taking 1 gram EPA/DHA daily increased the amount of weight lost among young men who were dieting to lose weight by 2.2 pounds in just 4 weeks (6). Build a few pounds of muscle and lose the same amount of fat in only 6 weeks. Without exercise or dieting (4). Enables you to workout harder and the more you can put into your workouts, the more calories you’ll burn. Which Fish Oil Supplement Should I Buy? Our favorite product is Oximega fish oil softgel capsules. It meets all of our requirements to be a top product without breaking the bank. Here are the reasons it’s Stayfitcentral’s favorite fish oil supplement. Every 2 capsule serving has 1.2 grams of omega 3’s ( EPA and DHA). The price is right. You get a superior supplement for just $.35 per serving. Its orange flavor and enteric coating masks any fishy taste and eliminates fishy burps. It uses the highest quality fish that’s tested to be free of contaminants and impurities. Third party tests from labdoor.com show that its ingredients exceed label claims. This means you get extra omega 3’s in every serving. Added vitamin E keeps your fish oil fresh. 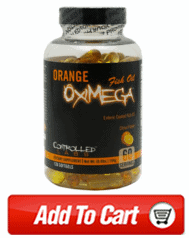 Click here to buy Oximega fish oil from our online store. 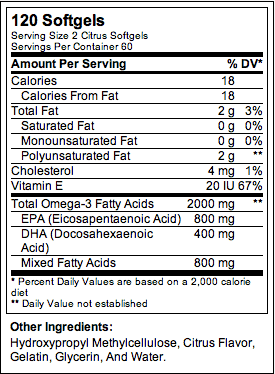 As you can see from the image to the right of Oximega’s ‘Supplement Facts’ panel, every serving has 1.2 grams (800 mg DHA and 400 mg EPA) per serving. This makes getting your daily dose convenient and simple. The amount of fish oil you need to take to help with weight loss appears to be 2-3 grams of EPA and DHA from fish or fish oil capsules every day. You can take it all at once or in divided doses. If you prefer to be conservative, start with 1 gram/day for a few weeks and increase as much as needed to see better results. Don’t worry that taking 2-3 grams/day requires swallowing a dozen capsules. As long as you’re using a concentrated source of omega 3’s like Oximega, you’ll only need to take a 4-6 easy to swallow softgels daily. Research suggests that you’ll get the most benefit from your fish oil when you also eat a low carbohydrate diet (5). According to the current research, it’s safe to take in the amounts mentioned in this article if you’re healthy (1). You should always check with your doctor before taking fish oil or any other supplement just to make sure it’s safe for you. 1. Cleland L, James M, Proudman S. Fish oil: what the prescriber needs to know. Arthritis Res Ther. 2006; 8(1): 202. 2. Gonzalez-Periz A, Horrillo R, Ferre N, et al. Obesity-induced insulin resistance and hepatic steatosis are alleviated by omega-3 fatty acids: a role for resolvins and protectins. FASEB J. 2009 Jun;23(6):1946-57. 3. Hill AM, Buckley JD, Murphy KJ, Howe PR. Combining fish-oil supplements with regular aerobic exercise improves body composition and cardiovascular disease risk factors. Am J Clin Nutr. 2007 May;85(5):1267-74. 4. Noreen E, Sass M, Crowe M, Pabon V, Brandauer J, Averill L. Effects of supplemental fish oil on resting metabolic rate, body composition, and salivary cortisol in healthy adults. Journal of the International Society of Sports Nutrition 20107:31. 5. Paniagua JA, Perez-Martinez P, Gjelstad IM, et al. A low-fat high-carbohydrate diet supplemented with long-chain n-3 PUFA reduces the risk of the metabolic syndrome. Atherosclerosis. 2011 Oct;218(2):443-50. 6. Parra D, Ramel A, Bandarra N, Kiely M, Martínez JA, Thorsdottir I. A diet rich in long chain omega-3 fatty acids modulates satiety in overweight and obese volunteers during weight loss. Appetite. 2008 Nov;51(3):676-80. Epub 2008 Jun 14. 7. Ramel A, Martinéz A, Kiely M, Morais G, Bandarra NM, Thorsdottir I. Beneficial effects of long-chain n-3 fatty acids included in an energy-restricted diet on insulin resistance in overweight and obese European young adults. Diabetologia. 2008 Jul;51(7):1261-8. Epub 2008 May 20. 8. Shichun Du,* Jie Jin, Wenjun Fang, and Qing Su. Does Fish Oil Have an Anti-Obesity Effect in Overweight/Obese Adults? A Meta-Analysis of Randomized Controlled Trials. PLoS One. 2015; 10(11): e0142652. 9. Thorsdottir I, Tomasson H, Gunnarsdottir I, Gisladottir E, Kiely M, Parra MD, Bandarra NM, Schaafsma G, Martinéz JA. Randomized trial of weight-loss-diets for young adults varying in fish and fish oil content. Int J Obes (Lond). 2007 Oct;31(10):1560-6. Epub 2007 May 15.